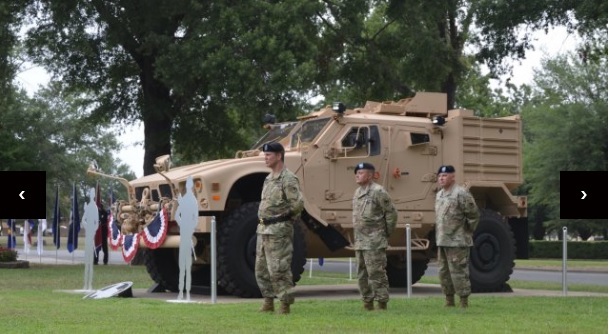 RED RIVER ARMY DEPOT, Texas — Distinguished guests, community officials, and depot employees gathered for the Red River Army Depot change of command ceremony July 18 where Col. Jason A. Carrico relinquished command of the depot to Col. Stephen M. York. Maj. Gen. Daniel G. Mitchell, commanding general of the Tank-Automotive and Armaments Command, officiated the ceremony. Mitchell served as Red River Commander from July 2008 to June 2011. The honor guard for the event was the TACOM Color Guard, and the music was provided by First Calvary Division, Ft. Hood, Texas. Sgt. 1st Class Gary Richardson served as commander of troops. The ceremony also featured a Texas salute with depot team members Rhonda and Scott O’Neal riding their horses. The pair presented flowers to Stacie Carrico and Kristin York, wives of both commanders. The invocation was given by TACOM Chaplain Lt. Col. Scott Koeman. RRAD team member Matthew Butler sang the National Anthem and RRAD team member Marshal McKellar served as the master of ceremonies. York comes to Red River after his last assignment as the Director of the Training Management Directorate, U.S. Army Combined Arms Center in Fort Leavenworth, Kansas. York, who is a native of Louisville, Kentucky, has 29 years of service. He was commissioned as a Transportation Second Lieutenant and received his Bachelor of Science Degree from Virginia Commonwealth University in 1993. He also holds a Master’s of Science Degree in Logistics Management from Florida Institute of Technology and Masters of Science in National Resource Strategy from the National Defense University. He has served in many positions and locations from Division Transportation Officer in Camp Red Cloud, Korea to Support Operations Officer at the Defense Supply Center in Columbus, Ohio.